Thousands jammed the streets to cheer drivers and teams for the ceremonial start of the Iditarod Trail Sled Dog Race. 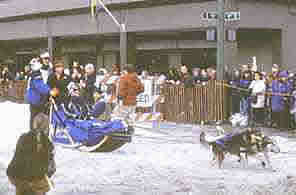 It's called "The Last Great Race" and, around Alaska, interest in the Iditarod dwarfs the Super Bowl or any other event. Throughout Alaska, the events leading up to the race dominate the media, continuing for days until the finish. My wife Mary and I were sampling the winter activities around Anchorage, and we quickly got caught up in the electric mood of the start of Alaskas most famous sporting event. Itarod sleddog team at the starting ceremony At the ceremonial start many viewers carried newspapers that featured photos and biographies of each entrant. Strolling vendors offered pins, hats, posters and other race souvenirs, while others sold cooked reindeer sausage, beverages and other temptations. Local favorites like Jeff King, Dee Dee Jonrowe and Martin Buser loped their sled dog teams through the sprawling block party to boisterous cheers and whoops. The Iditarod is symbolic because it happens when cabin fever frustration from Alaska's long winter is at its peak. The Iditarod is more than a race  it's a promise of spring. The reality of the race differs from popular images. Most surprising are the dogs. Jack London's stout huskies are a rare sight, replaced instead by smallish breeds better adapted for endurance. Mushers typically start with 16 dogs. As dogs tire or fail to pass a series of vet checks they are flown back to Anchorage. During the race, Iditarod addicts charter small airplanes and land in remote communities along the route to cheer on their favorites. We flew, but not in search of the departed dog teams. Ours was a flight for soar eyes. From our seats in Craig Ketcham's single-engine airplane, Mary and I looked into the depths of aqua-blue glaciers and across expanses of billowy snowfields. We flew alongside craggy edged slopes, where Dall sheep lambs cavorted on narrow, exposed rock ledges. Flying low and slow offers a sense of scope, size and dimension. 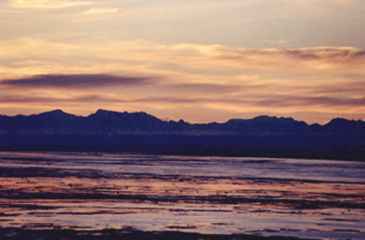 The Chugach Mountains and the Alaska Range frame Anchorage and spread for miles. 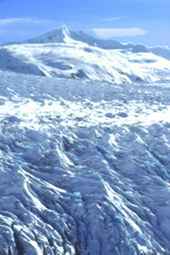 Snowfields and glaciers, such as Knik, Colony, Triumvirate, Capps and Spencer, continually reshape and sculpt the mountainous terrain. From our flying perch we looked down on a wilderness of snow and rock. Craig often lowered his plane just above the fissured glaciers, where frozen snow has been fractured into huge, sharp, teeth-like formations and where evaporation has siphoned out the moisture, creating an eerily soft, semi-transparent blue. Flightseeing is one of Alaska's prime attractions. Like others, Ketchum Air Service offer a variety of tours with the most popular being summer season's three-hour flights to Mount McKinley, North America's tallest peak. Floatplanes circle McKinley's lower elevations, land on lakes for snacks and stopovers, then fly back to Anchorage. We saw Mount McKinley, but not by air. On a staggeringly clear day we drove from Anchorage to Denali National Park. 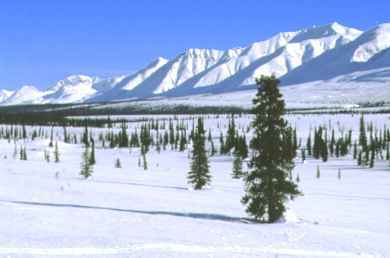 From roadside stops and impromptu pullouts we viewed sweeping panoramas of the range and the mountain, as well as herds of slumbering moose. While flightseeing we had also seen moose as they strolled over fields braided by seasonal waterways, ponds, and the Eagle River. Another day, during a 2-1/2 hour Resurrection Bay cruise from Seward through the Kenai Fjords, rain, wind, sleet, snow and fog left us shivering and, more disappointingly, with shrouded views. We saw enough to be tantalized, including sea otters, mountain goats and sea lions, but felt frustrated by all that we didn't see. We had started our Alaskan winter journeys with a trip to Alyeska. The brochures highlighted blue skies, steep runs, and incredible vistas that featured dazzling panoramic views of glaciers, mountains and Cook Inlet. Alyeska's claim to fame is based on its location, terrain, and dining. It is the most famous of Alaskas three downhill ski areas. Several years ago Conde Nast Traveler magazine rated Alyeska as having the best views of any North American ski area. Photographer: Tom Evans We had dreamt of enjoying Alyeskas renowned skiing, but as can happen at any world-class ski resort, the weather didnt cater to our wishes. It was raining on the afternoon that we arrived and the rain continued into the next day. Due to Alyeskas far northern latitude, its low base altitude of 306 feet is not normally a problem. But from time to time the resorts altitude and position on Cook Inlet makes it subject to a warm, wet storm. We waited at the bottom of the tram with hundreds of other skiers, while up higher ski patrollers blasted potential avalanche zones. Although it had rained all night at the base, 24 inches of snow had fallen at the top level of 2,300 feet altitude. Eventually the mountain opened. The tram gracefully whizzed up the nearly vertical slope in 3-1/2 minutes and deposited us in a blizzard of white. Hard-working crews had semi-groomed and marked otherwise buried trails. Going off-piste was nearly impossible in the wet snow. 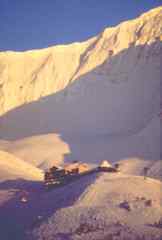 Alyeska's legendary North Face, which features double black diamond expert runs, was closed. 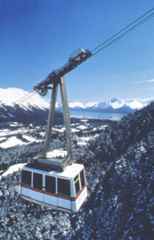 So was the high-speed quad that rises above the upper tram terminal serving many of the more challenging runs. "You should have been here two days ago," a local skier told us, recounting a wondrous day on virtually empty runs under bluebird skies. Ah, well...the next morning we were scheduled to leave for other activities in Anchorage, so we hoped to return on one of those bluebird days. That night at the Seven Glaciers restaurant, located at the tram's upper terminal, we did enjoy excellent views, actually, scrumptious views. Seven Glaciers is internationally famous for its gourmet meals. Even without the wine our dinner was intoxicating, although the bottle of Pinot Noir surely helped. The appetizer, rare seared ahi, was accompanied by beluga caviar, with crisp shallot potatoes and chive oil. Next came a poached pear salad with caramelized pecan vinaigrette, Danish blue cheese and a pear tomato. Then the entree  mesquite grilled shrimp with oven-roasted tomatoes, shiitake mushrooms, artichoke hearts, kalamata olives and stone ground mustard velout� over green onion fettuccini. Dessert was a triple chocolate mousse parfait. I remember the details well because the gourmet chef, LaMont Caldwell, autographed the menu for us. Just a few days later, on the final leg of our Alaska winter journey, we took a field trip back down the Turnagain Arm, with a brief stop at Alyeska. Sunshine flowed over the beautiful, snow-cloaked North Face. Skiers above carved grand, swooshing turns in clouds of powder, having the time of their lives. I watched, envious, but also glad to see Alyeska in all its glory. The Anchorage area had shown us the good, the bad and ugly, and the good again in our short winter visit. Click here for details to plan your own trip to Anchorage, Alaska.